With the launch of yet another inspirational canoe trail, Northern Ireland has recently become one of the most exciting ‘must go’ canoeing destinations in Europe. It all started back in 2005 with the launch of the Lough Erne canoe trail but now with the Blackwater, The lower Bann, Lough Neigh and the recent launch of the Strangford Lough Trail its not surprising so many people are ditching the gruelling drives up to Scotland and France and taking the 2 hour ferry over to the Green Isle instead. My trip took place just a few weeks before the launch of the Strangford Trail so I didn’t have the maps and trail guide to follow but I still managed to discover some of the delights that Northern Ireland has to offer. We had never taken our canoe on a ferry before so just in case we arrived at Holyhead harbour 2 hours early. We were first in the queue so the lady in the ferry port told us to go and get a coffee in the terminal building. What we didn’t realise was she meant get a coffee and come straight back to the car because twenty minutes later I looked out of the window and its total chaos outside. There were three lanes of cars and vans trying to squeeze past this little black mini which was blocking the entrance to the main boarding area for the ferry. We were so embarrassed as we scurried back to the car amidst the tooting horns when everyone realised it was our car. As we boarded the ferry the security guard stopped us, and we waited for some remark about our earlier mishap. Thankfully though the guy just looked up, pointed at our canoe, smiled and asked if we new something the Captain didn’t, then let us on our way. The Swift ferry journey was surprisingly relaxing with a cinema, bar, café’s and a viewing platform out back to stop any boredom setting in. Just over 2 hours later and we were docking in Dublin Bay and soon making our way over the boarder to the village of Ardmillan in Killinchy. We were booked into a little guest house called Barnageeha situated on the shore of the Lough. We had incredible views of the water from our room and ignoring the twin flex wiring and 70’s avocado bathroom suite the guest house was quite nice. We were up early the following morning and after a huge traditional breakfast, we managed to hit the hide tide perfectly and launched from the guest house’ front garden. Our hosts kindly let us leave our car in the safety of their grounds for a few days too which was really reassuring. The weather was perfect as we paddled our way out of the bay towards our first port of call on Mahee Island. Dating back to the 5th century the monastery ruins on Mahee are well worth a visit. You can still see the remains of the tower, a tide turbine, beautiful gardens and a sundial they used all those years ago and there’s also a nice visitors centre which is free to enter. By the time we’d looked round, it was almost lunch time so we hopped back into the boat and paddled off towards the town of WhiteRock. There is a lightship here where if you’ve not got a garden to launch from, this is the next best place. We however, were heading past the Lightship, past Sketrick Castle and on to a place called Daft Eddy’s. This place is renowned all over Ireland for its food and views, and it deserves all the praise it gets. You can even paddle to within 30 yards of the bar (if the tides in). Luckily as we arrived there was still plenty of water, so we left the boat on the beach and made our way up the slight slope to the pub. It was such a hot day we needed lots of refreshments. So much so that we didn’t noticed the tide going out and the huge expanse of mudflats which had appeared. Obviously we considered staying in the pub until the tide came in again but I didn’t fancy sleeping in a canoe that night so we made our way round the island until we found a small slipway with still a few inches of water left. Now we were heading for another island owned by the National Trust. Although I’m not officially allowed to mention the name in this article, if you give the NT a call they’ll happily give you permission to camp and the location. I guess camping is rotated between the islands depending on wildlife breeding seasons and the impact campers are having on the land. With over 70 islands to choose from though and the landscape changing continuously as the tide rises and falls, its well worth taking a GPS. When we eventually arrived at the correct island, we scrambled up the steep grassy bank and set up camp at the highest point. It was a great feeling, stood on our own private island with just a few cows and two goats to share it with. As I was sat admiring the view across the Lough I noticed something unusual in the water. There were lots of little black dots appearing in the distance. As they got closer I couldn’t mistake the movements of countless kayak paddles glistening in the sun. There must have been twenty maybe thirty sea kayakers all out enjoying the sunshine. Then amidst the mass of boats I hear a voice shout ‘is that Lou?’ It was Pete who’d heard about our trip online, and he’d brought his mates from the Belfast kayak club to come and see us. It was great welcome. As sunset fell the kayakers paddled off into the orange glow on the water. However, Pete and his mate Dave opted to stay the night and we spent the night sat under a tarp drinking wine and chatting about boats and the planning of future trips. The following morning Pete and Dave were up early and had the biggest breakfast imaginable on the go. Hubby could hardly move after the second extra large roll with double burger and bacon came his way. They certainly know how to cook over there. When we finally finished eating, and had packed up camp we paddled over to the harbour at Ringhaddy. Here we said goodbye to Pete and Dave but where soon joined by Frank another local paddler who had heard about our trip. I use the word paddler loosely as Frank had the most amazing sail rig set up on his canoe imaginable. He didn’t need a paddle. I’ve only ever used a downwind sail before but Frank’s boat could actually sail into the wind. How that works, he did try to explain but being blonde it still doesn’t seem possible in my head. Anyway off we set, hubby and I tandem paddling and Frank whizzing too and fro making the most of the strong breeze. We were now heading towards Salt Island and towards the furthest end of the Lough. It was a good 5 mile paddle and the water was quite choppy at times which added to the fun. The wildlife was wonderful. 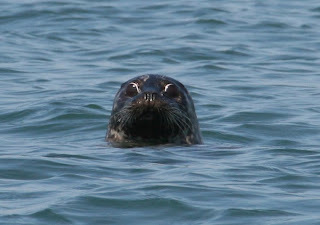 We saw so many seals pop up along side our canoe and the week before a leatherback turtle had been spotted in that area along with Basking sharks and porpoise. It was mid afternoon when we finally reached Salt Island. We wandered over to have a look at the new canoe Bothy that has been recently renovated as part of the canoe trails initiative. The Bothy is well equipped with a wood burning stove, toilet facilities and even tables and chairs. I believe you need to book the facilities in advance though and also bring along your own supply of wood for the stove. It’s £6 a night per person or £50 a night to book it exclusively. We however, were camping again, which is free if you pitch at the other end of the island. We chose a spot which looked out towards Wee Wife Island where all the seal pups sunbathe. Hubby went off for an introduction into canoe sailing with Frank, as I had fun erecting yet another style of tent. I’ve been testing a wide range of tents over the past six months for a forthcoming review. For this trip I’d chosen a Terra nova hyperspace and a Gelert Mongoose and you may be surprised at the results. That evening we were joined by a group of open boaters called the Piggin Paddlers, I never did ask where the name came from. They joined us for dinner and one of them kindly brought me fresh supplies of cheese and onion crisps which made my day. As the sun set once more Frank and the Piggin Paddler s headed back across the water to Killyleagh and hubby and I were left to enjoy the serenity of this beautiful island alone. During the night the wind picked up and by the time we were ready to leave in the morning it was a full blown hoolie. Being such a large Lough the conditions can resemble rough seas at times and it took all our skill and strength just to get off the beach with the huge breakers trying to force us back. I have to admit it was one heck of a paddle back and not one I’d like to do again in those conditions. As we passed White rock and made our way through the islands we encountered some serious tidal flows with some impressive standing waves which could have been fun if we’d had the strength to play. Then a little old man shouted from the bank saying ‘you don’t want to go that way’ we looked in disbelief as he went on to tell us how we had no chance in paddling against the current in our little canoe. Ok it was tough but we managed it fine and to be honest we had no choice as the guest house was through the next inlet. We only just made it back in time though and had to weave our way through the mudflats as low tide approached. With just minutes to spare (before we’d be mud bound) we managed to drag our boat back up into the garden, to the guest house. And there was our car, safely waiting to take us on our next adventure in Northern Ireland. Strangford Lough covers over 140sq km and with sections like the Narrows (extreme tidal flows) and the Routen Wheel (series of whirlpools and boils) it should be taken seriously. However, there are plenty of canoe guides and outfitters locally who can provide guided trips if required. If you want to go it alone then take all the usual safety precautions that you would at Sea and make the most of the CanoeNI website where there’s plenty of local information, maps and guides available. Toll: Remember to take a few Euro’s with you for the Toll road on the Republic side of the border.